The Hundred Demon Tribe in Turboranger. An unknown new enemy for a few episodes. The Evorian in Abaranger. Probably were born by Dai Satan's power. Ragorn and Dai Satan brought back to life many times. The Ashu of Boukenger. Presumably they are linked to Ramu and Gogu in Jetman. 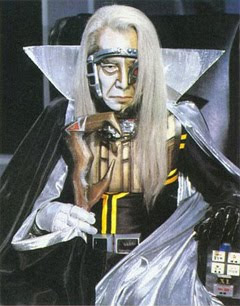 Dr. Man the founder of Shin Tenkoku in Bioman is a human being, the first human villain that is. He wanted to become the world's greatest genius and experimented on himself becoming an old man quite early. He aims to punish humanity for some reason probably due to a bitter past or his own experiments altered his brain. He had a son named Junichi who opposes him. When Mason discovers he is a human being, he was plotted for death but he used a mechaclone to fool them and later reprogramed them. In the end he repents and turns back to the light due to his human emotions. Yamimaru and Kirika- They became the next focus of villains after Zimba, Jarmin and Rehda died in battle against the Turborangers. They are half-human and are wandering due to them being half-Ashu. Yamimaru's parentage is not established but we know Kirika's father is an Ashu. Kou or Kibaranger in Dairanger is born from Shadam the Magician and a human being. Tsuruhime in Kakuranger is born from a youkai from Daimaou's servants and a human. She is another half breed. Eiji has the reverse. His mother is an oni and his father is a normal human like Achilles, son of the goddess Thetis and a mortal named Peleus or the goddess Sheng Mu and her mortal consort Liu Yong who bore their son Liu Chen Xiang. He is another outcast. I wonder why Ragorn never noticed him before? He is one like Yamimaru, a nagare bouma. Unlike Power Rangers Wild Force that presented only from MMPR, this one goes all the way back to Goranger (and they're now seniors mostly) who do something worthwhile again. After retiring, ll the red rangers come back for a grand return in Gaoranger vs. Super Sentai where a lot of classic mecha return. The use of bio energy in sentai series after Bioman. In Jetman, they face a monster that uses bio killer particles in the form of Meteorite BEM. 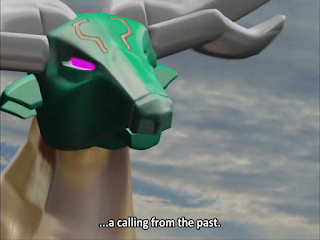 In Ohranger, they used the same kind of energy and faced a similar enemy that could neutralize their powers in the form of Bomber the Great.In Fiveman, Takeru could be that scientist who falls for Kasumi.In Abaranger, the destruction that Bandora caused in the past could have created Evorian. Sakura Nishiboshi of Boukenger is really hot. I mean I find her more attractive than Ptera Ranger or Houou Ranger and probably the fairest Pink Ranger ever. Well I kind of think about that I got sucked into watching Boukenger because of her as she was so pretty- prettier than the female rangers of my childhood sentai. Her character in Boukenger isn't the usual female pink ranger of being too soft. Instead, she isn't afraid to speak her mind out and that she actually does know how to operate a rifle- something I don't see even any of the original female heroines doing in their show.